"ALTO MAIPO Hydroelectric Project" (PHAM) of AES GENER and Luksic group is intended to channel the water of the main river that supplies water to the Capital city of Chile, Santiago. The Inter-American Development Bank (IDB) signed a $195 million loan agreement with Alto Maipo Spa, owned by AES Gener (60 percent) and Antofagasta Minerals (40 percent), as part of a financing package of more than $1.2 billion for the Alto Maipo Hydroelectric Project. The project is cofinanced by the International Finance Corporation, the U.S. Overseas Private Investment Corporation and six commercial banks. The total project cost will be roughly $2 billion, 60 percent in the form of debt and the remaining 40 percent in equity. 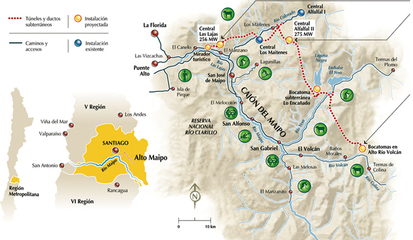 In Santiago there are only two main rivers; one of them, the Mapocho river, is fed in an 80% from Maipo river waters. The projects try to channel the water of the main tributary streams of the Maipo into a tunnel of 70km long, leaving a very minimal ecological volume of flow, inadequate for life. The associated infrastructure involves (among others): 2 run-of-the-river centrals; 70 km of an abduction tunnel of 6-8 mt. in diameter; 4 water intakes; several siphons; one electrical substation; power transmission lines; charging cameras; 14 marine stockpile sites; use of trains, Tolva lorries, TBM machines, etc., etc. 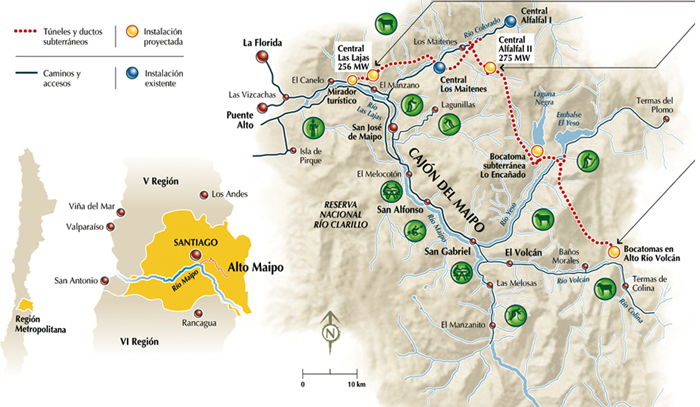 In its 5-year construction period, this project is going to bring a lot of dangerous impacts: threatens the safe supply of drinking water to 7M people in Santiago; endangers irrigation waters for agriculture; accelerates the melting of glaciers and recharging of aquifers desertifying 100.000 ha of the basin and its area of direct influence; it will affect local economy based on tourism around the river, natural monuments, flora and fauna, environmental services like provision, climate regulation, habitat, etc. in the most democratic green lung of the capital city. The impacts are irreversible and long lasting. The benefits for locals are few and the typical ones: no more than some jobs for unskilled workers. The installed project capacity is 530 MW but the actual power generation capacity is 160 MW. This energy will go integrally to Minera Los Pelambres (Luksic group) in the north of Chile. Site Cajon del Maipo (High Maipo River Watershed), Comuna de San José de Maipo, Santiago. Project Details The associated infrastructure involves (among others): 2 run-of-the-river centrals; 70 km of an abduction tunnel of 6-8 mt. in diameter; 4 water intakes; several siphons; one electrical substation; power transmission lines; charging cameras; 14 marine stockpile sites; use of trains, Tolva lorries, TBM machines, etc., etc. The installed project capacity is 530 MW but the actual power generation capacity is 160 MW. This energy will go integrally to Minera Los Pelambres (Luksic group) in the north of Chile. Other Glacier melting acceleration; affectation to priority sites for biodiversity conservation and natural monuments. Other loss of local economy based on tourism due to degradation of landscape and of the river. Why? Explain briefly. In 2011, a commission of inquiry of the Chamber of Deputies determined that the project was approved with irregularities, but nothing happened and now is starting to be built. The use of water for energy for mining projects is above (more important) than the human and animal right to water. Local communities and territory are impacted and the benefits fly to other parts of the country. El Ciudadano "Alto Maipo: Si el río suena… represas trae"
El Desconcierto, "El agua de Santiago en Riesgo… AltoMaipo y el fin del Cajón"